Moving the Needle: Reed Johnson walks off with a home run, +.354 WPA. The Cubs appeared well on their way to a 1-0 victory in this one. 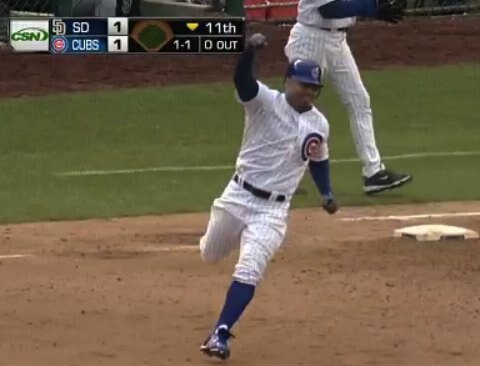 Carlos Marmol came on for the top of the ninth, but couldn’t close the door. Cameron Maybin’s walk and stolen base, followed by Will Venable’s bunt single — ballsy move with the tying run in scoring position with one out — led to Jason Bartlett’s sac fly, which put this one into extras. The Cubs avoided disaster in the 10th and the 11th. Johnson made sure that they couldn’t blow it in the 12th. On a 1-1 pitch he took Luke Gregerson deep, giving the Cubs the win. Matt Garza: 6 IP, 6 H, 0 R, 3 BB, 9 K. That’s now 34 strikeouts in 24.2 innings this season. The solid game helps get the old ERA in line with the FIP. Dustin Moseley: 6 IP, 5 H, 1 R, 0 ER, 1 BB, 4 K, 9 GB. The ground balls have come in quite handy for Moseley this season. Also, the four strikeouts he recorded were as many as he did in his first three starts combined. 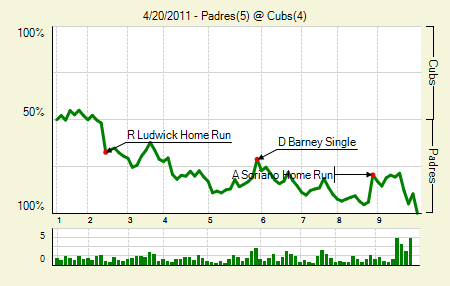 Moving the Needle: Ryan Ludwick homers for the Padres’ first two runs, +.156 WPA. After an intense, low-scoring first game the Cubs and the Padres brought some runners around in the second half of the twin billing. Ludwick got things started with a two run blast. I love homers of all types, but there’s just something about a guy reaching for and driving a low and inside pitch that makes it a little more special. It was one of three homers for the Padres in the game. Ludwick also doubled twice. Alfonso Soriano: 2 for 4, 1 2B, 1 HR. His eighth-inning shot brought the Cubs to within one, but that was as close as they’d get. He now has as many extra base hits, nine, as singles. Cameron Maybin: 2 for 4, 1 HR. He’s shown considerable power as a Padres, with two doubles, two triples, and three homers among his 15 hits. Chris Denorfia: 3 for 5, 1 HR. He’s been a solid, if underrated, contributor to the Padres in the last two seasons. Moving the Needle: Jed Lowrie does Jed Lowrie-like things, +.194 WPA. Lowrie had a .496 wOBA headed into this game, which is going up with his 2 for 4 night, including a two-run shot off Gio Gonzalez. That’ll teach him to throw Lowrie — or anyone, for that matter — a changeup right down the middle. That gave the Sox a 4-1 lead in the sixth, which made them a bit more comfortable as the A’s mounted a couple of rallies in the late innings. 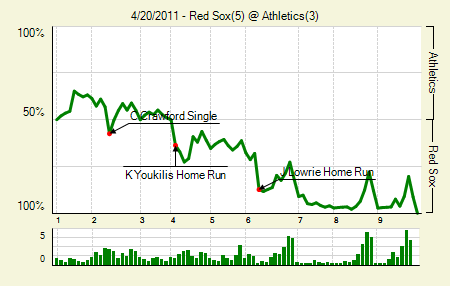 Kevin Youkilis : 2 for 4, 1 HR. He’s finally off the interstate with this performance. Not that it matters too much. His wOBA was .371 heading into the game. Coco Crisp : 2 for 5, 1 HR. That’s his first on the year. Last year he displayed some quality power, hitting eight homers and 14 doubles in 328 PA.
Moving the Needle: Michael Saunders gives the Mariners false hope in the ninth, +.161 WPA. The Mariners actually had the top two WPA plays of this game. 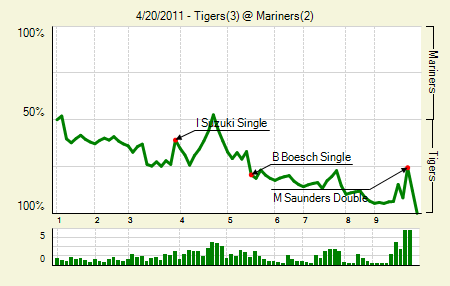 Ichiro’s RBI single in the third added 13% to the Mariners’ win expectancy. Saunders’s double meant the tying run was on second with one out. But the Mariners couldn’t bring him home, and the Tigers walked away with the victory. Rick Porcello: 6.2 IP, 4 H, 1 R, 1 ER, 1 BB, 6 K, 0 HR, 12 GB. He had quite an inflated ERA headed into the game, and this will help. Groundballs and strikeouts? That’s why the Tigers drafted him. Moving the Needle: Ty Wigginton caps a four-run second with a homer, +.133 WPA. After getting owned by the Giants last night, the Rockies made their presence known early in this one. They went down 1-0 in the first, but in the second they went double, hit by pitch, single, homer. 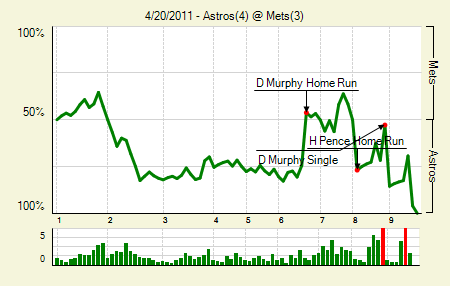 That opened up a 4-1 lead, and nearly led to more, as they loaded the bases before finally sitting down. It was not a banner day for Matt Cain. Nope. Not at all. Troy Tulowitzki: 3 for 5, 2 2B. He hadn’t recorded a hit in the first two games of the series, so he needed to compensate. The Rockies drove him in each time he reached base. Buster Posey: 2 for 3, 1 2B. He drove in both of the Giants’ runs. Jorge de la Rosa: 7 IP, 4 H, 2 R, 2 ER, 2 BB, 6 K, 0 HR. Not spectacular, but another solid effort from de la Rosa. 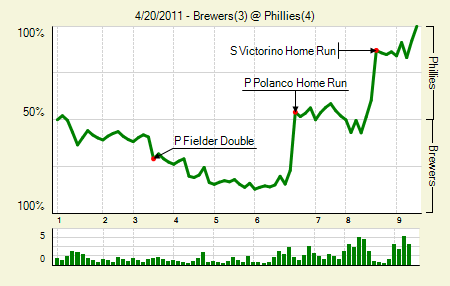 Moving the Needle: Placido Polanco ties the game with a homer, +.312 WPA. Chris Narveson did a good job of holding down the Phillies through five, allowing just one hit and walking another. But he allowed one of each in the sixth before Polanco came up. He drove the pitch out to left, tying the game at three, setting the stage for a much needed Philadelphia win. Shane Victorino: 2 for 3, 1 HR, 1 BB. His homer to lead off the eighth gave the Phillies the go-ahead run. Prince Fielder: 3 for 3, 1 2B, 1 BB. He has struck out in just 11.8% of his AB this season (22.5% for this career). Moving the Needle: Colby Rasmus kills a rally with a double play, -.154 WPA. The Cardinals fell behind 7-0 by the bottom of the third, but they started to chip away at the lead. Rasmus hit a homer and a two-RBI single to aid the effort, but when he came to the pate as the tying run he couldn’t come through. Instead he hit a grounder to second, eating two outs and putting the Cardinals in a tough position. Though they’d add one more run that inning, they couldn’t make up the entire deficit. Albert Pujols: 2 for 4, 1 HR, 1 BB. He still has only one double on the year, which is just weird to type. That was his fourth homer and his seventh hit in his last five games. Danny Espinosa: 3 for 5, 1 3B. Now slugging .563 on the season, with a .271 ISO. 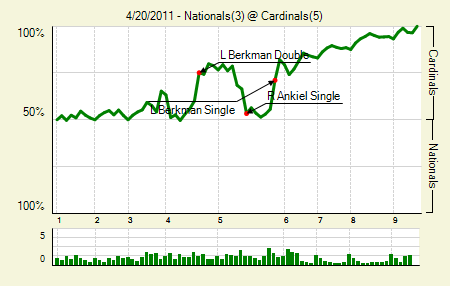 Moving the Needle: Lance Berkman grounds one up the middle and brings home the go-ahead run, +.155 WPA. Berkman also had the second-highest WPA swing of the game, adding 15.1% to the Cardinals’ win expectancy with an earlier RBI double. 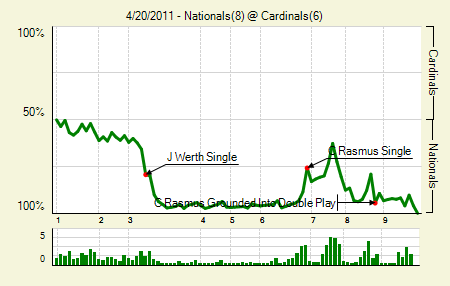 This game was a nice little bounce back for the Cardinals after a near comeback in the early game. Yadier Molina : 2 for 3, 1 2B. His RBI single in the fifth gave the Cardinals a little breathing room. 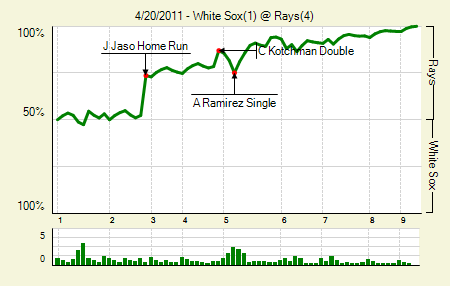 Moving the Needle: John Jaso crushes a two-run shot to deeeeeeep right, +.213 WPA. There is probably one baseball-sized portion of the strike zone where Jaso could possibly hit one that far. Philip Humber apparently found that precise location. Jaso hit it over the seats in right, putting the Rays up 2-0. That’s all they’d need, as the White Sox continued their scoring drought. They’ve scored just nine in their last six games. Matt Joyce: 2 for 3, 2 2B, 1 BB. After a slow start he’s 13 for his last 24 with five doubles. Wade Davis: 7 IP, 6 H, 1 R, 1 ER, 2 BB, 2 K, 1 HR. That’s a lot of contact, and the majority of balls in play were in the air. I suspect that the White Sox slumping offense had plenty to do with this, but this will help Davis’s stat line, at least. 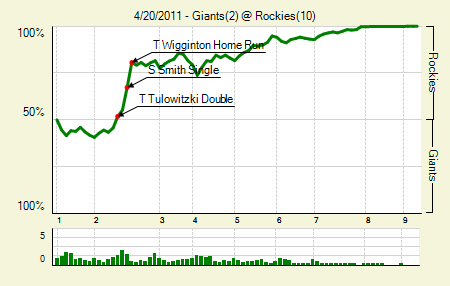 Moving the Needle: Matt Wieters creates some separation with a second-inning homer, +.138 WPA. For his first two seasons in the bigs, Wieters failed to live up to the considerable hype, but he’d shown just enough to keep people interested. This year it appears he’s putting it together. Yesterday he went 1 for 2 with a walk and a two-run homer that gave his team a 4-1 lead in the second. Against the offensively inept Twins, that should be enough. Turns out it wasn’t, but it was close. He is now 7 for his last 22 with two doubles, two homers, and two walks. 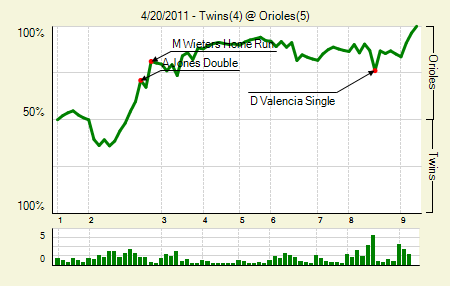 Danny Valencia: 2 for 4. Notable because he drove in three of the Twins runs. Hey, someone other than Kubel and Span has to start hitting. Vlad Guerrero : 2 for 4, 1 HR. His solo shot was the Orioles’ fifth run, which ended up being the difference. The walk-less streak is up to 71 PA this season. Moving the Needle: Curtis Granderson triples down the line to open up a 2-0 lead, +.128. The knock on Granderson has always been that he can’t hit lefties. He did little to shed that reputation in his first year with the Yankees, but this year he’s come out the gate hitting them hard. Last night he faced Brett Cecil, a guy who handled the Yankees with aplomb last season. With a runner on first and one out in the second, Granderson turned on Cecil’s first pitch and drove it down the first base line and all the way into the corner. Russell Martin scored the second Yankees run and Granderson hustled into third. He now has six hits in 17 AB against lefties, including four for extra bases. Bartolo Colon: 6.2 IP, 5 H, 2 R, 2 ER, 2 BB, 7 K, 1 HR. For a guy who hasn’t started a game since May, 2009, he looked pretty sharp. Two fastballs with movement generated seven ground balls, while a changeup and slider induced most of the swings and misses. Mark Teixeira: 3 for 5, 3 2B. 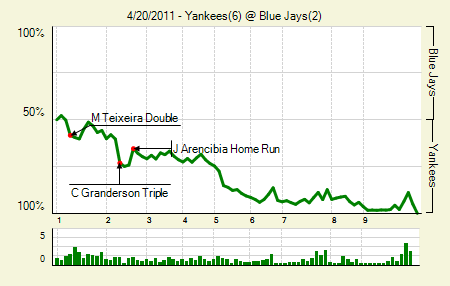 The media narrative was that Teixeira had to put his slow Aprils behind him and get off to a good start. He’s done that, with a .431 wOBA. Moving the Needle: Shin-Soo Choo doubles in the go-ahead run, +.186 WPA. 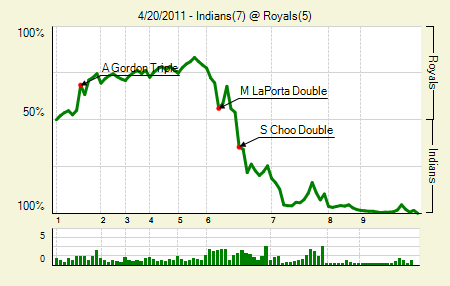 Who thought that a Royals-Indians series in April could be so compelling. It was a well-played contest by both sides, and would have been even more memorable had Luke Hochevar not melted down in the sixth inning, balking home the tying run and then giving up the double to Choo. The Indians would score another in the inning, and then cash in on two Hochevar walks to open the seventh. The Royals did make a valiant comeback effort in the ninth, but were ultimately stalled when still behind two. The Indians have — get this — the best record in the American League. This is the only appropriate response. Jeff Francoeur: 2 for 4, 1 HR, 1 BB. It’s always notable when Francoeur walks. His ninth inning homer brought the Royals to within two. Too bad it was one of those rally-killing homers! How dare he guarantee his team more runs? Travis Hafner: 2 for 5, 1 2B. He’s now hitting .351/.406/.632 (.436 wOBA). It won’t last, but it’s been terrific to see the Pronk of old so far this season. 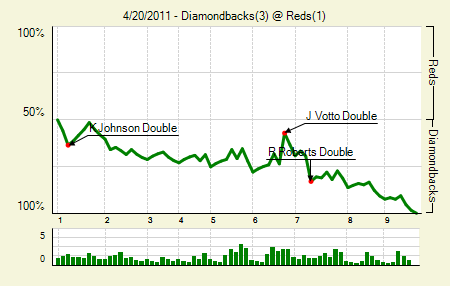 Moving the Needle: Joey Votto tries to bring the Reds back in the sixth with an RBI double, +.165 WPA. The DBacks opened up a 2-0 lead in the second, which held up until the sixth. Votto’s double scored Drew Stubbs all the way from first, cutting the lead to one. But the Reds couldn’t bring home that runner from scoring position, and couldn’t really get anything going the rest of the way. The Diamondbacks answered with an insurance run the next inning. Votto has still reached base in every game he’s played this season. Ryan Roberts: 1 for 3, 1 2B, 1 BB. His seventh-inning double provided that insurance. He’s now hitting .378/.465/.757 (.514 wOBA) on the season. Roberts appears to be a late bloomer; while he had a poor 2010, he did have a .348 wOBA in 351 PA as a 28-year-old in 2009. Moving the Needle: Chris Coghlan comes through with a bases-loaded single, +.169 WPA. There are few things more frustrating in baseball than when a team fails to score with the bases loaded. 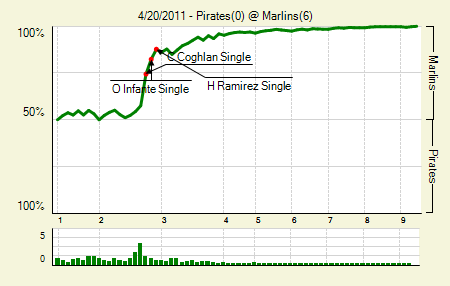 That’s not why Coghlan’s two-out, two-run single was the high WPA score from the game, but I’m sure that Marlins fans felt a lot better when he did come through. Well, it appeared that he wouldn’t, since he kind of bounced the ball to second. But Neil Walker double clutched on the throw and Coghlan beat it out. Emilio Bonifacio then beat the throw home to score the second run. Ricky Nolasco: 7 IP, 4 H, 0 R, 1 BB, 8 K. This was a nice bounce back after a rough outing against Atlanta in his last turn. Ground balls and strikeouts. It’s still a marvel that Nolasco hasn’t put it together for more than one season. 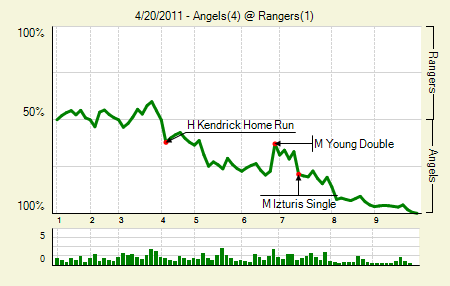 Moving the Needle: Michael Young doubles in the Rangers’ only run, +.147 WPA. From watching a fair number of Rangers games this year, it appears that Young is having a lot of success going the opposite way. He put another notch in his belt last night, smacking one down the right field line and scoring Elvis Andrus from first. The Rangers still trailed, as they would the entire game, but this one got them going a bit. Jered Weaver: 9 IP, 6 H, 1 R, 1 ER, 0 BB, 8 K. I’m not sure what’s happened to Weaver in the past two years, but he’s pitching like an ace. The Ace label works well for the Angels, who pair him with Dan Haren for one of the stronger 1-2 punches in the league. Howie Kendrick: 1 for 2, 1 HR, 2 BB, 1 HBP. And the hot start continues. His wOBA is up to .429, including a .311 ISO. Weaver’s continued success and a breakout from Hendrick will go a long way in the Angels exceeding expectations. Moving the Needle: Juan Uribe singles home a pair, +.171 WPA. 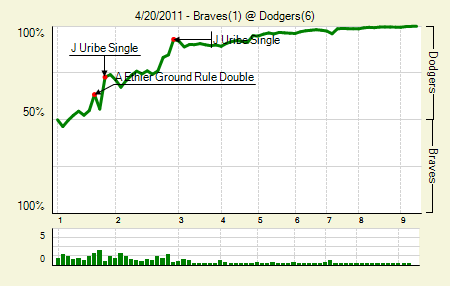 It’s been a terribly slow start for newcomer Uribe. He came through in the first inning of this one, though, grounding one through the hole between third and short to score the runners on second and third. He’d come through the next inning, too, lining one to left with the bases loaded to score a pair. Even with the 3 for 4 day, his wOBA sits at .250, so he still has some catching up to do. Jon Garland: 9 IP, 4 H, 1 R, 1 ER, 2 BB, 4 K, 0 HR. Huge performance in only his second start of the year. Andre Ethier: 3 for 4, 1 2B, 1 HR. Hey, you can’t let Matt Kemp do all the heavy lifting, right? 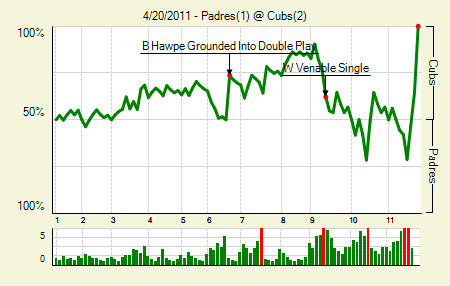 Moving the Needle: Justin Turner strikes out with the tying run on third and one out, -.327 WPA. I am friends with many Mets fans, both in real life and on the internet. Hell, my Sunday league team is named the Mets, so I do have a soft spot for them, Yankee fandom aside. It broke my heart, in a way, when I saw the deluge of “DON’T BUNT” tweets coming across my Twitter stream. That was Josh Thole in the ninth, with Jose Reyes on first and one out. He popped it up, which led to a double play and, effectively, killing the Mets chances. Turner’s strikeout, though, was so costly because it turned into a double play. The ball got away from J.R. Towles and Angel Pagan tried to score, but was tagged out at the plate. Those were two great opportunities squandered by the Mets. Brett Wallace: 2 for 4, 1 2B. Things haven’t gone so bad in his first gig to start a season. He’s now hitting .293/.379/.397 in 66 PA.
Jose Reyes: 4 for 4, 2 SB. He’s heating up in his contract year, .329/.360/.488 with 8 stolen bases. Still, why bunt there? There are other options in the playbook. We hoped you liked reading The Morning After: Game Recaps for April 20th by Joe Pawlikowski!